The next month is going to be a busy period for NJPW internationally. Ahead of the G1 Special at the Cow Palace on July 7th, NJPW has a show in conjunction with Kenny Omega and CEO Fighting Game Championships in Daytona Beach on June 29th and Strong Style Evolved events in the United Kingdom on June 30th and July 1st. KUSHIDA, SANADA, EVIL, and BUSHI will also be appearing at ROH's June 29th Best in the World pay-per-view and subsequent television tapings. After announcing four matches for the Cow Palace, NJPW revealed the cards for the Strong Style Evolved shows today. Night one will be taking place in Milton Keynes and will be headlined by Minoru Suzuki & Zack Sabre Jr. defending their Revolution Pro Wrestling British Tag Team titles against Kazuchika Okada & Tomohiro Ishii. 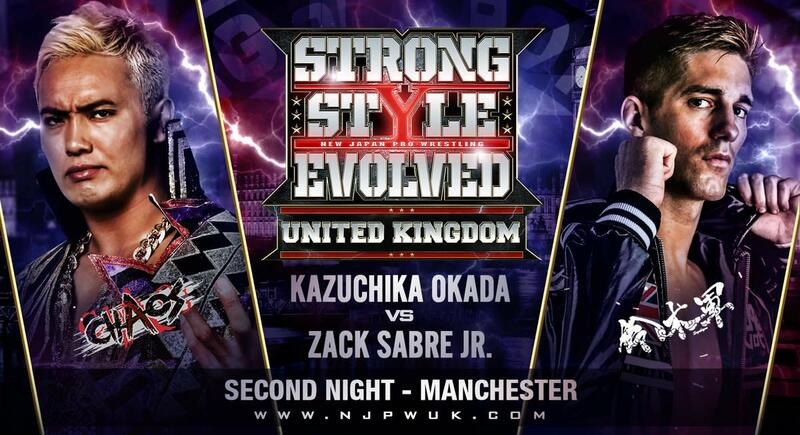 That match will lead into the next night in the Manchester area, with Ishii vs. Suzuki for the RevPro Undisputed British Heavyweight Championship and Okada vs. Sabre. Ishii vs. Suzuki is a match that NJPW has been building up. At Dominion, they were on opposite sides of a tag match and then brawled after it was over. Okada vs. Sabre is a rematch of this year's Sakura Genesis main event. Kazuchika Okada vs. Zack Sabre Jr.